Today, I was in Cambridge for the FEB Central Regional Conference, a gathering of church leaders from the association we are a part of. It was an opportunity to learn and grow. There were updates on various church plants as well as case studies of established churches that have experienced revitalization. Seeing how God is at work to grow and renew the church is both encouraging and inspiring. I also attended a workshop on, “Handling Public Backlash to Church Sexual Ethics.” The leader who led it experienced the challenge of having a church discipline case go viral and explode in the media. 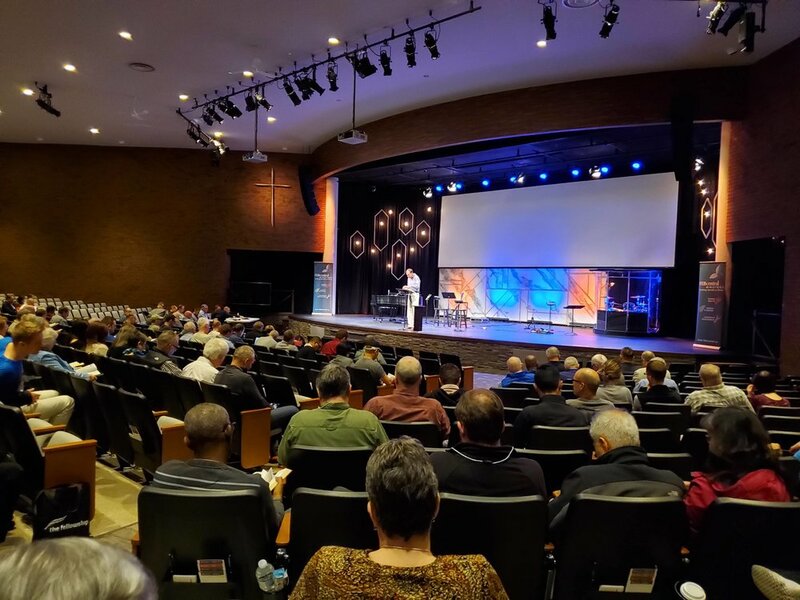 He addressed how churches can prepare scripturally, administratively and legally and shared how to handle both internal and external communication and response with potentially volatile incidents. The workshops, updates and reports were bracketed by an exposition of the longest chapter in the Bible, Psalm 119, by speaker, Mike Bullmore. His teaching did what all good teaching should do: move me to look closer at the Bible. The result was four questions to help get more out of Bible reading. Reading the Bible is not only one of the most important things a Christian can do to grow, it’s also for many one of the most difficult things to do. Psalm 119 provides some help. 1. Do you seek to know the Bible or to know God through the Bible? If I’m honest, I can sometimes be unclear about what my real goal in spending time in the Bible really is. I know that it’s important, but I can forget why. Reading Psalm 119, it’s clear that just learning more about the Bible is not the goal. God is. A deeper relationship with God is the goal of reading the Bible and, conversely, a deeper relationship with God is also what fuels more Bible reading. As you read the psalm, you can’t help but be moved by the psalmist’s longing to know God and how this longing is intertwined with his commitment to know and follow God’s Word. For example, in v. 10 he writes, “With my whole heart I seek you; let me not wander from your commandments!” There is a pursuit of God not just a pursuit of biblical knowledge. Or in v. 64, he says, “The earth, O Lord, is full of your steadfast love; teach me your statutes!” His experience of the love of God drives him to want to learn more about God’s will for his life. When you read the Bible, are you seeking God? Is it personal or just academic? 2. Do you ask God for the help you need to engage the Bible? I have always known how richly and poetically Psalm 119 describes the Bible and its value. What Mike Bullmore pointed out was that it’s actually filled with prayers. The psalmist is all too aware that, on his own, he can’t read the Bible as he should. He needs help. And so he prays. He prays that God would open his eyes (v. 18), teach him (v. 33), give him understanding (v. 34), lead him (v. 35), incline his heart to God’s will (v. 36), and turn his eyes away from things that would distract (v. 37). If the psalmist needs prayer to make the most of his Bible reading, I know that I need prayer even more. But these prayers are encouraging because they help explain why satisfying times of Bible reading can sometimes be elusive. It’s a reminder that we need the help that only God can give to really hear Him in His Word. 3. Do you do more than just read the Bible? 4. Do you expect more than just knowledge from the Bible? Given the rich, God-ward orientation of the psalmist’s approach to engaging Scripture, it’s not surprising that he experiences more than just getting more knowledge from his study of the Bible. The Bible is what keeps him pure (v. 9), guards him from sin (v. 11), makes him wiser (v. 98), gives him understanding (v. 130) and grants him great peace (v. 165). Clearly, there are riches to be gained from time in God’s Word. Reading the Bible can be cold and impersonal. I can get caught up with words and fixated on getting it done, so that I forget the One who spoke the words and miss all that He wants to do in my life as I open the Bible. This psalm reminds me to take a different approach. May God bless you as you seek His face in the Word today. And if you need some inspiration and help in re-orienting your way, maybe you should have a slow, deliberate read through Psalm 119. What can we learn about life from the Book of Psalms? Could managing this one thing revolutionize your spiritual life in 2018?